President Muhammadu Buhari will speak with the U.S President, Donald Trump today on phone by 3:45 pm local Nigerian time. President Buhari will be phoning the U.S President from his London base at 9:45 am Washington time, which is 3:45 pm in Nigeria and 2:45 pm in London. In a series of tweets, the Personal Assistant to Buhari on New Media, Bashir Ahmad confirmed the news. 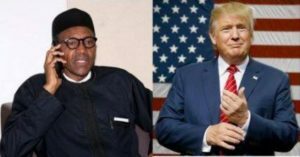 Buhari to Phone Trump today He said, President Buhari will also speak on phone with the president of South Africa, Jacob Zuma. However, the reason for the proposed call is not yet disclosed but speculations are that it will not be far from being a congratulatory call to President Trump over his emergence as the 45th President of the United State of America from the Nigerian President. Indications also suggest that President Buhari will, during the call, make Nigeria’s fight on global warming, fight against corruption and the various steps taken to salvage the country from recession. Also, indications suggest that President Buhari may also seek U.S support in the fight against corruption, economic growth of Nigeria and other interests. Recall that President Buhari has been in London on a working leave which initially was to last for ten days but was extended indefinitely after the ten days elapse so that results from the series of test President Buhari did while on vacation will be out, his letter to the National Assembly had read.